Home » Out! Series » Gross Out! Thanks, Jada! I’m glad you enjoyed reading about gross animals. I think you will love WATCH OUT! about dangerous animals when it comes out next year. Happy Reading! Hi. I am Olivia. I really enjoyed you coming to my school, Greenfield, today. 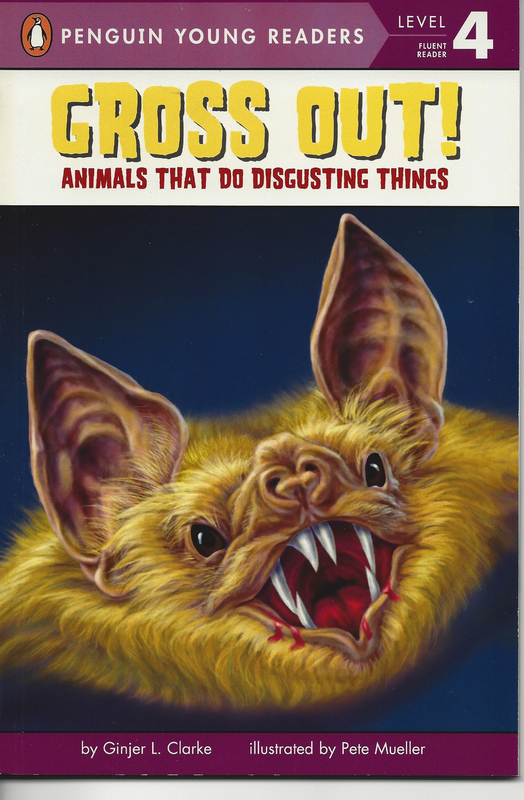 I really liked “Gross Out”. I hope you visit my school again soon. Thanks, Olivia! I had a great time visiting your school today and would love to come back another time after I have some more new books to share with you all. Happy Reading! Mrs. Clarke Gross Out is a disgusting book but it’s Cool Thank You sooooooooooooo much for writing books!! I’m so glad you like Gross Out! Thanks for reading. Mrs.Clarke I’m very happy you responded to my letter thanks a lot. I can’t wait to read your new books. Were is the picture of your dog. Ms.Clark i loved your baby otter book! Im so excited to read your new books! i am sorry for im,i coudent find a top comma! Thanks, Anabel! I’m glad you enjoyed reading about river otters. Hi, Anabel. Click on the About Ginjer page and you will see pictures of my silly pets. Enjoy! Hi Ginger thanks for coming to my school today me and my bff found 2 of your out! books grossout! and black out!.I LOVE animals. BJ is so cute! (Callie and Little Mac too).PLEASE write back I have LOADS to tell you! Hi, Cayton. I had a great time visiting Grange Hall Elementary yesterday. I hope you enjoy reading my books. My silly cat Callie is sitting on my hands right now while I try to type. Happy Reading! did you think about putting orangutangs in your book? they “eat their food twice”, meaning they eat their puke. i saw it at the zoo once. think about another gross book. Hi, Elena. Thanks for writing, and this is a great suggestion. I’ve been thinking that I may do a Gross Out! 2 book of some kind, and this would definitely make it in there. Happy Reading! Hi Ginjer.I think you should write a book about facts about hermit crabs. dear ginger I think your books are the best! I read all of your books there great! my favorite is cheetah cubs. also I like black out! I had a great time visiting your school. Happy Reading! Thank you for coming to Kipps! I loved all your books. Hi, Daniel. I had a great time visiting your school, and I’m so glad that you enjoy my books. Happy Reading!